Nestled in the East Texas piney woods of Bear Bottom, four generations of family tradition surrounds Bear Creek Smokehouse. Originating in 1943, Hick and Nellie Shoults have raised and cured their own smoked meats. Since then, the Smokehouse has grown from a backyard venture with 600 birds to one of East Texas’ largest facilities producing a wide variety of smoked delights. 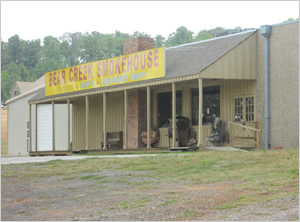 Bear Creek Smokehouse is one of the oldest stores in the United States, offering products such as ham, peppered pork tenderloins, smoked ribs, pork loins, brisket, a variety of birds and much more! The store also offers a range of soups and beverage mixes, along with chocolate fudge and praline pecan desserts. Over the years, the Smokehouse has prided itself on never surrendering the quality and taste of the “old-fashioned” way of hickory smoking. They believe their customers keep coming back because of the way they continue to create smoked meats without compromise. Locally, the Bear Creek Smokehouse salesroom presents the Shoults’ down-home country atmosphere, accentuated by the family’s next generation of traditional values. 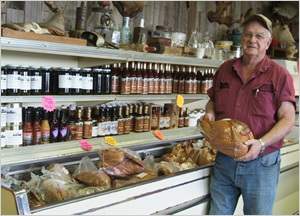 Bear Creek Smokehouse’s first customers were local grocers who placed orders at the local Agricultural Extension office. Today, their customers reach into the thousands and can order over the phone, by mail, fax or online. With their mouth-watering Bear Creek smoked meats, the company has become a holiday tradition in homes across the nation. Each year the holiday season brings a rush of enticement to the Smokehouse. They thrive on the sense of knowing homes around the country are filled with the irresistible fragrance of slowly smoked hickory embers cut from wood on their farm in Marshall, Texas. With their family pride on the line, Bear Creek Smokehouse takes exceptional care with every order of their old-fashioned family secrets. Bear Creek Smokehouse began working with the Kilgore College SBDC in an attempt to reconsolidate debt and refinance existing loans, in anticipation of expanding its product line and balancing out seasonal workforce. They are presently working with a local bank to secure financing and hope to be able to move forward with their new product lines and equipment purchases in 2012-2013. Along with this positive impact on cash flow, Bear Creek has been able to secure and increase its current line of credit to meet the needs of this expansion. Bear Creek Smokehouse is currently in the process of requesting funds from Marshall Economic Development Corporation through a grant proposal. This grant would cover the cost of additional equipment needed to grow their increasing product lines. New equipment means new jobs created for the company. As of March 2012, Bear Creek Smokehouse employed fifty-six (56) workers averaging $25.94/hour, with 90% of those listing Marshall, TX has their home address. These grant funds would help create and retain more jobs in Harrison County while creating economic impact for the area. Bear Creek Smokehouse intends to create a minimum of nineteen (19) additional jobs over a five year span. The newly created jobs would be considered full time jobs and have an average hourly rate of at least $10 per hour, well above the federal mandated minimum wage rate. Bear Creek Smokehouse also projects that this increase of nineteen (19) jobs could grow larger due to the expanded product line. Bear Creek Smokehouse has also developed a partnership with Riba Foods to develop a Bacon Jam© that will be sold in HEB Foods and other major food markets. This new partnership with Riba Foods will carry a commitment to expand and develop our canning capability and increase our production line. Riba Foods has already begun the process of moving some equipment to our factory to achieve this expansion. Bacon Bark© is also a new product line along with other confectionary items that will allow Bear Creek to retain existing employees and create new employment. Bear Creek Smokehouse is an established, family owned business with a history and future full of entrepreneurial success. As a Kilgore College SBDC client, we will continue to look for new ways to help them grow their business and create another 69 years of accomplishment for the Shoults Family.